Milton Peter Cashner, 1847-1934 (circa 1911, public domain). Born in Allentown, Lehigh County, Pennsylvania on 22 November 1847, Milton Peter Cashner was a son of John Cashner and Mary Ann (Snyder) Cashner (1827-1902), and the brother of Emaline/Emeline, Sarah, Alice, and Frank Cashner, who were respectively born circa 1842, 1844, 1849, and 1852. During their early childhood years, Milton Cashner and his siblings resided with their parents in Lehigh County, but the family’s harmony was disrupted sometime during the early to mid-1850s by the sudden death of their patriarch. Their family matriarch, Mary Ann (Snyder) Cashner, who was the oldest child of Peter Snyder and Elizabeth (Haas) Snyder, then wed a second time – to blacksmith Thomas Newhard. 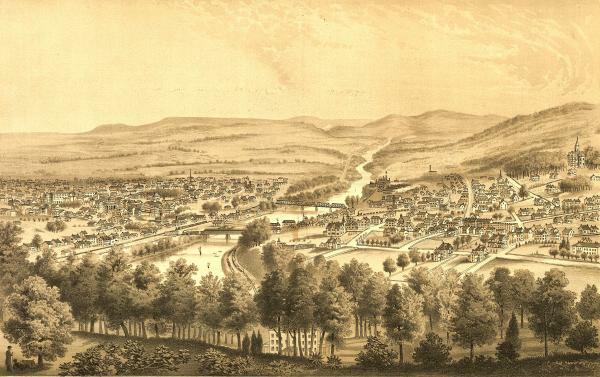 By 1860, the newly reconstituted family was residing in Allentown’s 4th Ward and included: Thomas Newhard and his wife, Mary Ann (Snyder Cashner) Newhard, Emaline/Emeline, Sarah, Alice, Frank, and Milton P. Cashner (who were shown on the federal census that year as having the surname “Newhard”), and their half-siblings Truses C. D. Newhard (1855-1891) and Oscar Newhard (1857-1937). Half-siblings Newton G. Newhard (1863-1916), Martin/Maine Newhard, and Montford/Monte Newhard then soon followed. As the United States descended into the darkness of secession and disunion, Milton P. Cashner found work in the same trade as that of his stepfather – blacksmithing. At the age of 18, Milton P. Cashner enrolled for Civil War military service at the Union Army’s recruiting center in Norristown, Montgomery County, Pennsylvania on January 24, 1864. He then officially mustered in that same day as a Private with Company B of the 47th Regiment, Pennsylvania Volunteer Infantry. He could not have known it at the time, but he was entering service with the 47th Pennsylvania Volunteers just in time to make history with his new comrades in arms. 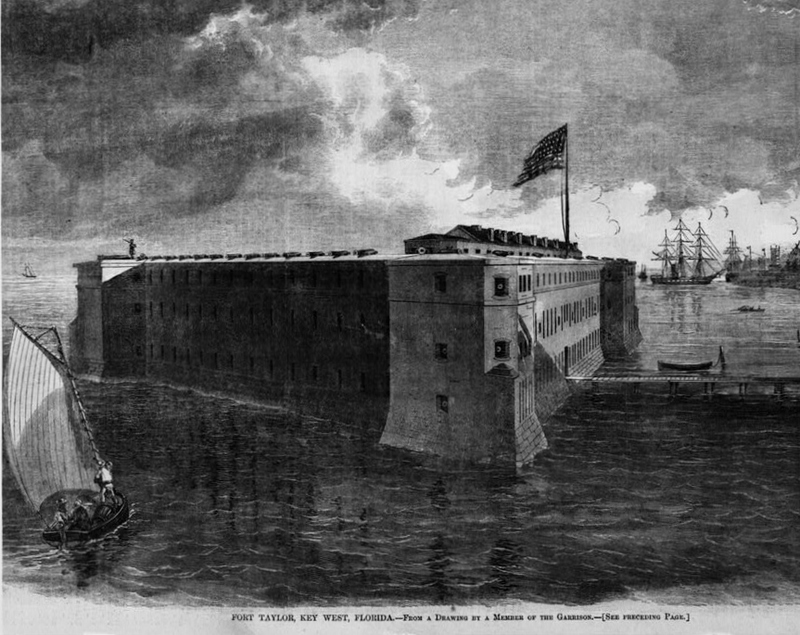 Connecting with the 47th Pennsylvania Volunteers at their duty station at Fort Taylor in Key West, Florida, Private Milton Cashner boarded a steamer with his regiment on 25 February 1864, and headed for Louisiana. Arriving three days later in Algiers (across from New Orleans), the 47th Pennsylvanians were then moved by train to Brashear City before heading to Franklin via steamer through the Bayou Teche. There, the 47th Pennsylvania joined the 2nd Brigade, 1st Division of the Department of the Gulf’s 19th Army Corps, and became the only regiment from the great Keystone State to serve in the Red River Campaign of Union General Nathaniel P. Banks. In B Company, John Fries and Tilghman H. Reinsmith were wounded; Edward Fink was killed. Others were captured, marched roughly 125 miles to Camp Ford near Tyler, Texas, and held there as prisoners of war (POWs) by Confederate forces until released during prisoner exchanges beginning 22 July. At least two members of the 47th died while in captivity there while still others remain missing to this day, possibly having been hastily interred on or between battlefields – or in unmarked prison graves. 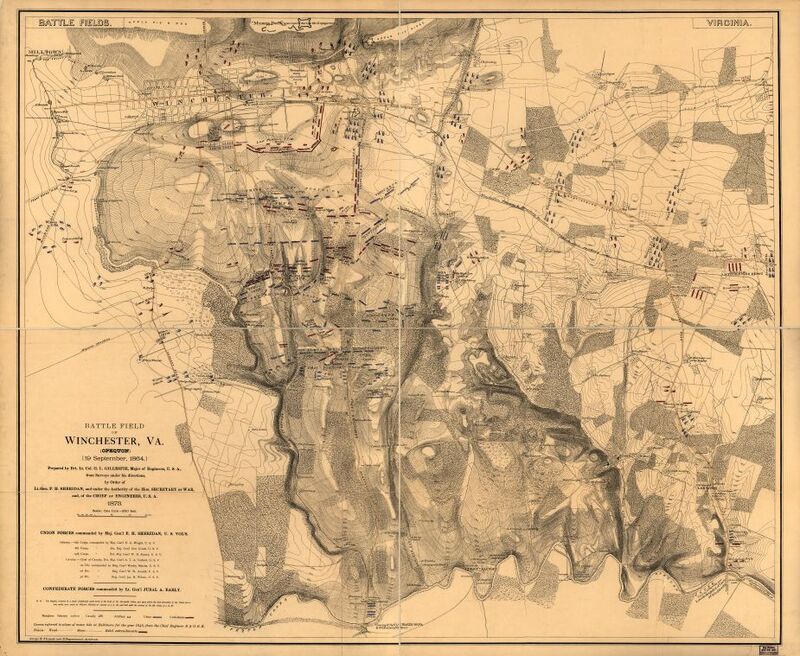 Following what some historians have called a rout by Confederates at Pleasant Hill and others have labeled a technical victory for the Union or a draw for both sides, the 47th fell back to Grand Ecore, where they resupplied and regrouped until 22 April. 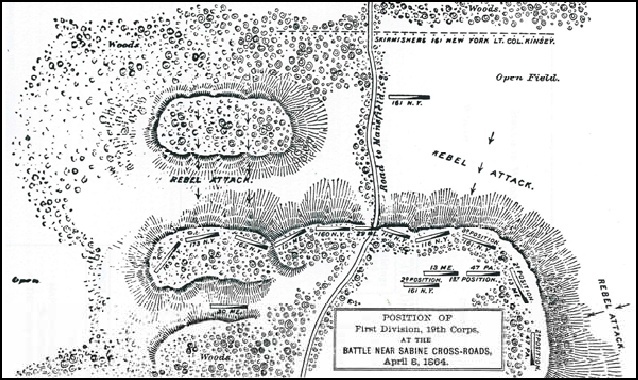 Retreating further to Alexandria, they and their fellow Union soldiers scored a clear victory against the Confederates near Monett’s Ferry in the Battle of Cane Hill on 23 April. 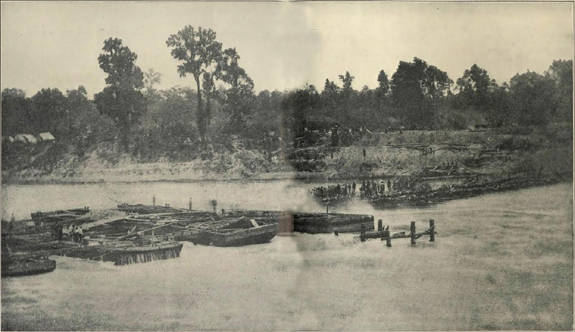 Christened “Bailey’s Dam” for Lieutenat Colonel Joseph Bailey, the officer overseeing its construction, this timber dam built by the Union Army near Alexandria, Louisiana in May 1864 facilitated Union gunboat passage on the fluctuating waters of the Red River (public domain). From 30 April to 10 May 1864, the 47th Pennsylvania Volunteers were tasked with helping to build a dam across the Red River near Alexandria, Louisiana in order to help facilitate the passage of Union gunboats. Beginning 13 May, the regiment moved to Morganza, and then to New Orleans on 20 June. Along the way, disease claimed still more men. Due to the delay, Private Milton Cashner and his fellow boys from B Company missed out on a memorable encounter with President Abraham Lincoln, and also missed the fighting at Snicker’s Gap, Virginia. From 23-24 September 1864, the regiment’s first and second in command, Colonel Tilghman H. Good and Lieutenant Colonel George W. Alexander, both mustered out honorably upon the expiration of their respective terms of service. Fortunately for Private Milton Cashner and his fellow 47th Pennsylvania Volunteers, they were replaced by others equally beloved for their temperament and front line experience, including John Peter Shindel Gobin, who would be repeatedly advanced in rank after being transferred from his role as Captain of C Company to the regiment’s central command. Sheridan’s Army also began the first Union “scorched earth” campaign during this period, starving Confederate forces and their supporters into submission by destroying Virginia’s farming infrastructure. Viewed by many today as inhumane, the strategy claimed many innocents. This same strategy, however, almost certainly contributed to the turning of the war further in favor of the Union. 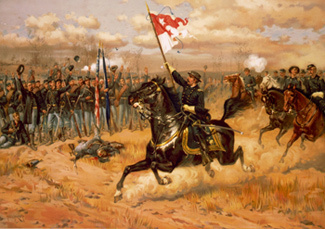 Early’s men, successful in many prior engagements but now weakened by hunger, strayed from battlefields in increasing numbers to forage for food, thus enabling the 47th Pennsylvania and others under Sheridan’s command to rally and win the day during the Battle of Cedar Creek on 19 October 1864. Through it all, the casualty rates for the 47th continued to climb, including with Company B, which saw a number of its members killed, severely wounded in action, felled by disease, or captured and imprisoned as POWs at Confederate prisoner of war camps. 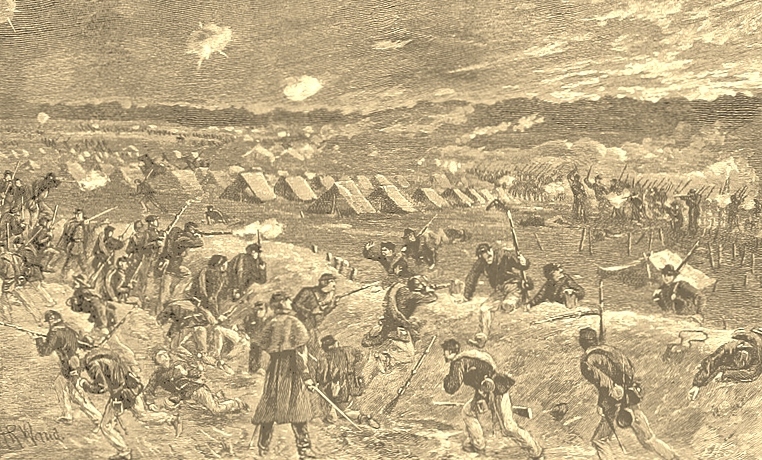 Given a slight respite after Cedar Creek, the men of the 47th were quartered at the Union’s Camp Russell near Winchester from November through most of December before receiving orders to assume outpost duty at Camp Fairview in Charlestown, Virginia (in what is now West Virginia) just five days before Christmas. Right leg gunshot wound sustained by Private Milton P. Cashner in 1865 while serving with the 47th Pennsylvania (U.S. Census of Union Veterans and Widows of the Civil War, 1890, public domain; double click to enlarge). While many 47th Pennsylvania Volunteers were celebrating the beginning of a New Year and hoping it would be a better one than the four previous they had spent in combat, Private Milton Cashner was having a far less auspicious beginning to the final year of the American Civil War. In January 1865, he was shot in the leg while on duty at Stevenson’s Station in Virginia. As a result, he was awarded a veteran’s furlough in order to receive medical treatment and fully recover from the wound. In the wake of that “Vulnus Sclopet” (gunshot wound), and as an unfortunate consequence of the confusion regarding the spelling of his surname which had persisted throughout his tenure of service with the 47th Pennsylvania Volunteers, he was subsequently charged with desertion – a charge which proved to be incorrect. Honorable Discharge of Private Milton P. Cashner (as “Kashner, Milton,” Pennsylvania Civil War Veterans’ Card File, public domain). As further confirmation that the charges against him were incorrect, Private Milton P. Cashner was not among the names of 47th Pennsylvania Volunteers listed on the Descriptive List of Deserters. Like many Civil War veterans who had been wrongly charged with being AWOL (absent without leave), he simply had been the victim of sloppy Union Army paperwork. At home in Pennsylvania – on an approved military furlough – he had been recovering from a gunshot wound sustained in service to his nation while an overworked, inattentive hospital clerk was inadvertently tarnishing his service record by entering the wrong data about him on a muster roll. As later records confirm, Private Milton P. Cashner was officially, honorably discharged from the 47th Pennsylvania Volunteers on 1 November 1865. Bethlehem, Northampton County, Pennsylvania, 1877 (U.S. Library of Congress, public domain). Following his return to Pennsylvania’s Lehigh Valley and his subsequent recovery from the gunshot wound he had sustained in Virginia, Milton P. Cashner set off down a new road in life. After marrying in 1870, he and his wife, Ellen (1856-1931), began to greet the arrival of children at their home in South Bethlehem. On August 2, 1886, he joined his local chapter of the Grand Army of the Republic. Before the 1880s were over, a son and daughter – William Joseph (1887-1889) and Hattie M. C. Cashner – opened their eyes in Northampton County for the first time. Tragically, both died soon after their respective births. Following her passing on 16 April 1887, two-month-old Hattie was laid to rest at the Fountain Hill Cemetery in Bethlehem, Northampton County. Sixteen-month-old William then succumbed to “breast fever” on 9 January 1889, and was interred beside her at the same cemetery. Like many of his fellow 47th Pennsylvania Volunteers, Milton Cashner continued to suffer from health problems long after his American Civil War service was over. On 26 July 1886, he filed for his U.S. Civil War Pension. In June 1890, he and his wife then welcomed the arrival of another child – Charles H. Cashner. In 1900, Sholes’ Directory of the Bethlehems described Milton Cashner’s occupation as “justice,” and noted that he resided with his wife at 343 Broadway while operating a home office at 344 Broadway. The 1900 federal census taker confirmed that he and his wife had been married for 30 years, that they had had seven children together, only five of whom had survived by this time, and that their young son, Charles, was still in elementary school. DEATH OF MRS. THOMAS NEWHARD – Mrs. Mary Ann, widow of Thomas Newhard died on the 24th of March, of apoplexy, at her residence in South Bethlehem. Deceased was born in South Whitehall, Lehigh county, on Aug. 24tb, 1827, and was a daughter of Peter and Elizabeth Snyder. She was twice married. The surviving children of the first marriage are Justice M. P. Cashner, of South Bethlehem, and Frank J. Cashner, Fountain Hill, and of the second, Oscar, Newton and Monte Newhard. Pennsylvania’s State Treasurer reported that Milton Cashner was paid $25 for his commissioned work as a Notary Public in 1910; a federal census taker that year also noted that Cashner’s wife had given birth again sometime between 1900 and 1910, but that their child had not survived infancy. This federal census also described his occupation as real estate agent, and documented that son, Charles, had followed his father into the real estate industry, where he was employed as a clerk. During this era, Milton Cashner’s U.S. Civil War Pension increased from $12 per month in 1910 to $50 per month in 1920. 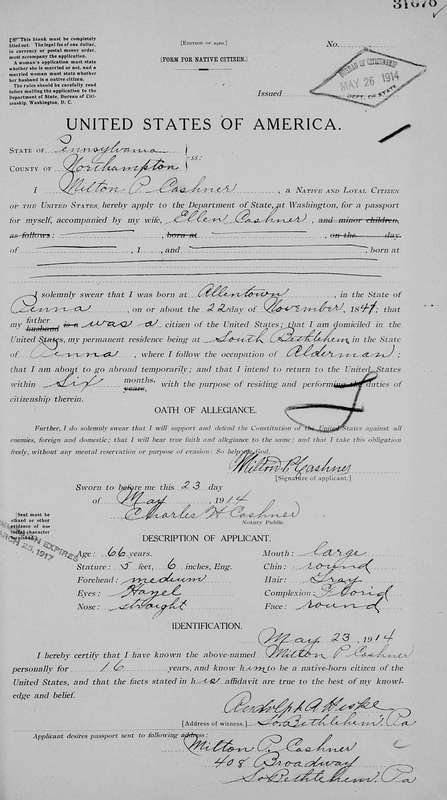 U.S. Passport application of Milton P. and Ellen Cashner, 1914 (U.S. National Archives and Records Administration, public domain). 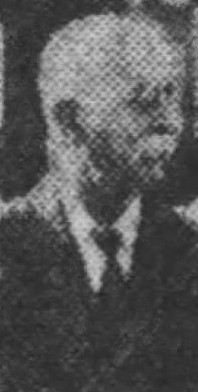 The 9 February 1912 edition of The Allentown Democrat documented that he was a “Justice of the Peace and real estate agent of South Bethlehem while other documents confirmed that he continued to remain active as a member of the Grand Army of the Republic, serving in leadership roles at the state level as well as with his local G.A.R. chapter during the 20th century’s opening decade. When he and his wife applied for U.S. Passports on May 23, 1914, he described himself as a 66-year-old Alderman who was 5’6” tall with gray hair, hazel eyes, and a round face with a florid complexion, straight nose, medium forehead, and large mouth. Their application was notarized by their son, Charles H. Cashner, a Notary Public. In 1916, he was appointed to another term as Justice of the Peace for South Bethlehem in Northampton County. Another old time fireman observed in the line of parade was Milton Cashner. In his 82 year, a member of the Lehigh Hook and Ladder Company of Bethlehem, Milt was nosed out of winning the prize for the oldest fireman in line by one year. Residing with his wife on Wyandotte Street in Bethlehem in 1930, Milton Cashner had finally retired by the time the federal census taker had arrived on his doorstep that year. Also residing at their home was a boarder, 83-year-old William Rice. The next New Year brought heartache, however; on Christmas Eve, 1931, Milton P. Cashner was widowed by his wife, Ellen. His wife was then laid to rest at the Fountain Hill Cemetery in Bethlehem, Northampton County. Three years later, Milton P. Cashner then answered his own final bugle call, passing away at the age of 84 in Bethlehem, Northampton County, Pennsylvania on 18 December 1934. Following funeral services, he was interred beside his wife at the Fountain Hill Cemetery in Bethlehem. 2. Cashner, Milton P., in Records of Burial Places of Veterans. Harrisburg, Pennsylvania: Commonwealth of Pennsylvania, Department of Military Affairs, 6 October 1931. 3. Cashner, Milton P. and Ellen, in Sholes’ Directories of the Bethlehems, 1900-1901. Bethlehem, Pennsylvania: Times Publishing Co., 1900. 4. Cashner, Milton P. and Kershner, Milton (alias), in U.S. Civil War Pension General Index Cards (application no. : 581009, certificate no. : 1159171, filed by the veteran on 26 July 1886). Washington, D.C.: U.S. National Archives and Records Administration. 5. Death of Mrs. Thomas Newhard. Allentown, Pennsylvania: The Allentown Democrat, April 2, 1902. 6. Elizabeth Haas, Peter Snyder, Mary (Snyder) Cashner, John Cashner, Milton P. Cashner, Frank K. Kashner, Thomas Newhard, et. al., in The Pennsylvania-German: A Popular Magazine of Biography, History, Genealogy, Folklore, Literature, etc., Vol. VII, H. A. Schuler, ed. Lebanon, Pennsylvania: Press of Report Publishing Company, 1906. 7. Kashner, Milton, in Civil War Muster Rolls, in Records of the Department of Military and Veterans’ Affairs (Record Group 19, Series 19.11). Harrisburg: Pennsylvania Historical and Museum Commission. 8. Kashner, Milton P., in Civil War Veterans’ Card File, 1861-1866. Harrisburg, Pennsylvania: Pennsylvania State Archives. 9. “Kershner, Milton now known as } Milton P. Cashner,” in United States Veterans Administration Pension Payment Cards. Washington, D.C.: U.S. National Archives and Records Administration (certificate no. : 1,159,171), 1909-1934. 10. Milton Cashner, in Firemen’s Parade at Hellertown Sat. Nazareth, Pennsylvania: The Nazareth Item, 27 June 1929. 11. Milton P. Cashner (re-appointment as Justice of the Peace). South Bethlehem: The Allentown Democrat, August 25, 1916. 12. Milton P. Cashner, in Pennsylvania Grand Army of the Republic Membership Records. Harrisburg, Pennsylvania: Pennsylvania Historical and Museum Commission, August 2, 1886. 13. Milton P. Cashner (Justice of the Peace, Northampton County), in Report of the State Treasurer on the Finances of the Commonwealth of Pennsylvania for the Year Ending November 30, 1900. Harrisburg, Pennsylvania: Wm. Stanley Ray, State Printer of Pennsylvania, 1901. 14. Milton P. Cashner (Notary Public Commissions), in Receipts for January 1910, in Report of the State Treasurer on the Finances for the Year Ending November 30, 1910. Harrisburg, Pennsylvania: Charles F. Wright, State Treasurer, Commonwealth of Pennsylvania, 1911. 15. Schmidt, Lewis G. A Civil War History of the 47th Regiment of Pennsylvania Veteran Volunteers. Allentown: Self-published, 1986. 16. U.S. Census and U.S. Census of Union Veterans and Widows of the Civil War (1890). Washington, D.C. and Pennsylvania: 1860, 1890, 1900, 1910, 1920, 1930.